With this product, you earn 51 Reward point(s). 51 points = $0.51. Mulberry, a plant that grows in China, Korea and Japan, has been used in traditional Chinese medicine, in particular as an herbal tea. 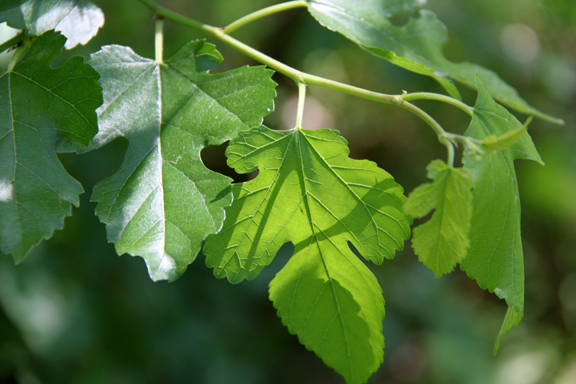 Mulberry leaf tea's health benefits are attributed to its naturally occurring compound, 1-deoxynojirimycin, or DNJ. DNJ is responsible for mulberry's antidiabetic effects, which have been studied extensively. Mulberry leaf tea also has powerful antioxidant properties and has been found to lower cholesterol and triglycerides and reduce inflammation. According to an article published in the "International Journal of Food Sciences and Nutrition" in 2006, mulberry leaves contain calcium, iron and zinc. Mulberry also contains the antioxidants ascorbic acid and beta carotene. Antioxidants inhibit cellular damage caused by free radicals, which get created during food digestion and smoke and radiation exposure. Regularly consuming foods and drinks rich in beta carotene may reduce your risk of cancer, according to PubMed Health. Type 2 diabetes is characterized by increased blood glucose levels. According to a study published in "The American Journal of Chinese Medicine" in 2012, mulberry lowers blood glucose due to its gallic acid content. In a study published in "Diabetes Care" in 2007, this effect was shown in Type 2 diabetes patients. In the study, everyone in a diabetes group and a healthy control group received a sucrose drink, but some also got mulberry extract, while the others got a placebo. Blood glucose was tested beforehand and two, three and four hours after sucrose consumption. The results showed that taking mulberry significantly curbed glucose spikes in the first two hours after consumption. The scientists concluded that mulberry could be useful both in the treatment of diabetes and in its prevention. In a study published in 2013 in "BioMed Research International," triglyceride and LDL cholesterol levels were lowered significantly in patients given 280 grams of mulberry leaf powder three times daily for three months. A study published in 2010 in the "Journal of Clinical Biochemistry and Nutrition" found similar results after giving participants 12 milligrams of mulberry leaf extract three times daily for three months. These studies suggest that regular heavy doses of this herb may be required to see significant results in lowering cholesterol and triglycerides. However, sipping some mulberry leaf tea regularly may help prevent high cholesterol. According to a study published in 2013 in the "Journal of Functional Foods," mulberry leaf has been traditionally used to treat inflammation caused by chronic diseases, and the results of the study verify its anti-inflammatory effects. In vitro, scientists found mulberry leaf inhibits inflammatory agents in the body, cutting off the body's inflammatory response. This effect was shown in rats in a study published in 2010 in "Phytotherapy Research." Rats with induced paw edema were introduced to mulberry, which inhibited the formation of inflamed paw tissue. These studies suggest mulberry leaf tea could be used to help ease pain by reducing inflammation. Wang W, Zu Y, Fu Y, Efferth T. In vitro antioxidant and antimicrobial activity of extracts from Morus alba L. leaves, stems and fruits. Am J Chin Med. 2012;40(2):349-56. Imran M, Khan H, Shah M, Khan R, Khan F. Chemical composition and antioxidant activity of certain Morus species. J Zhejiang Univ Sci B. 2010 Dec;11(12):973-80. doi: 10.1631/jzus.B1000173. Shankar S, Singh G, Srivastava RK. Chemoprevention by resveratrol: molecular mechanisms and therapeutic potential. Front Biosci. 2007 Sep 1;12:4839-54. Review. Kim SB, Chang BY, Jo YH, Lee SH, Han SB, Hwang BY, Kim SY, Lee MK. Macrophage activating activity of pyrrole alkaloids from Morus alba fruits. J Ethnopharmacol. 2013 Jan 9;145(1):393-6. doi: 10.1016/j.jep.2012.11.007. Epub 2012 Nov 16. Kimura T, Nakagawa K, Kubota H, Kojima Y, Goto Y, Yamagishi K, Oita S, Oikawa S, Miyazawa T. Food-grade mulberry powder enriched with 1-deoxynojirimycin suppresses the elevation of postprandial blood glucose in humans. J Agric Food Chem. 2007 Jul 11;55(14):5869-74. Epub 2007 Jun 8. Lans CA. Ethnomedicines used in Trinidad and Tobago for urinary problems and diabetes mellitus. J Ethnobiol Ethnomed. 2006 Oct 13;2:45. Wang HJ, Chiang BH. Anti-diabetic effect of a traditional Chinese medicine formula. Food Funct. 2012 Nov;3(11):1161-9. doi: 10.1039/c2fo30139c. Kandylis K, Hadjigeorgiou I, Harizanis P. The nutritive value of mulberry leaves (Morus alba) as a feed supplement for sheep. Trop Anim Health Prod. 2009 Jan;41(1):17-24. doi: 10.1007/s11250-008-9149-y. Epub 2008 Mar 15. Chen YC, Tien YJ, Chen CH, Beltran FN, Amor EC, Wang RJ, Wu DJ, Mettling C, Lin YL, Yang WC. Morus alba and active compound oxyresveratrol exert anti-inflammatory activity via inhibition of leukocyte migration involving MEK/ERK signaling. BMC Complement Altern Med. 2013 Feb 23;13:45. doi: 10.1186/1472-6882-13-45. Pirvulescu MM, Gan AM, Stan D, Simion V, Calin M, Butoi E, Tirgoviste CI, Manduteanu I. Curcumin and a Morus alba extract reduce pro-inflammatory effects of resistin in human endothelial cells. Phytother Res. 2011 Dec;25(12):1737-42. doi: 10.1002/ptr.3463. Epub 2011 Mar 28. Kaewkaen P, Tong-Un T, Wattanathorn J, Muchimapura S, Kaewrueng W, Wongcharoenwanakit S. Mulberry Fruit Extract Protects against Memory Impairment and Hippocampal Damage in Animal Model of Vascular Dementia. Evid Based Complement Alternat Med. 2012;2012:263520. doi: 10.1155/2012/263520. Epub 2012 Aug 16.